Developed as a replacement for the aging S-2 Tracker, the S-3A Viking was designed at the outset to provide computer controlled avionics and a maintenance friendly airframe. Lockheed provided both of those and once the learning curve was mastered by operators and technicians alike, the S-3A proved to be a superlative shipboard ASW platform and a relatively easy aircraft to maintain. Age hits all electronics and a decade or two into the aircraft's service life, a major electronics suite upgrade was initiated along with some airframe systems improvements, the upgrades being significant enough to warrant renaming the plane S-3B. The last plane was modified in 1993. 120 airframes were produced, which includes a number of development airframes, most of which were eventually stripped of all mission equipment and outfitted with extra seats to become the US-3A COD (carrier on-board delivery). The aircraft's long range made it perfect for moving priority equipment and personnel to the battle groups in the Indian Ocean and Western Pacific. Initially these US-3s were assigned to the air wing's S-3 squadron, but later were incorporated into VRC-50 based at Cubi Pt in the Philippines then Andersen AFB in Guam until withdrawal in the early 1990s when the planes were then sent to the boneyard after the disestablishing of VRC-50. The S-3B fared little better. After finding themselves quite useful in the tanking role (thanks to the early retirement of the KA-6D) during Desert Storm, the B models had all their relatively newly installed ASW upgrades removed and the planes then became little more than glorified tankers, a role for which one plane was modified in the late 1970s but the idea rejected! Ah, the short-sightedness of Brass and Politicians! When the ASW mission was taken from the S-3 so was the last carrier-based enlisted aircrewman who operated the ASW gear. Now all ASW is either shore-based with the P-3 Orion or with the LAMPS SH-60 helos. 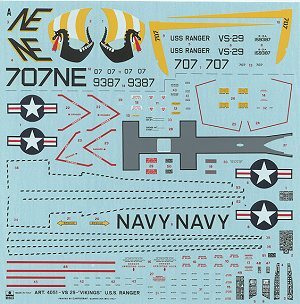 Recently reboxed by Italeri as an S-3B (a decal change only) the ESCI kit is still the only 1/48 S-3 Viking kit available in this scale. The kit includes a full bomb bay and four MK 46 torpedoes. Two Harpoons are also included for the wing pylons. 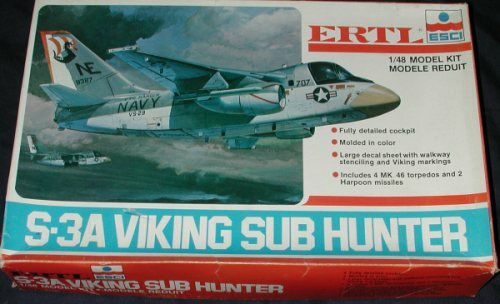 The Harpoons are only for use on the S-3B kit as the S-3A never had this system installed. The cockpit is fair and since this is an ESCI boxing and not the later AMT or Italeri version, you can actually see through the canopy (other boxings are very dark). The cockpit consists of seats, sticks and tub. Instruments are decals. No aft cabin area is provided. You can also have the boarding stairs open but they lead up to nothing. A full MAD boom and refueling probe are also given. Unless undergoing maintenance (or a broken cable) these items were always fully retracted on the ground. Same with the supplied FLIR pod. The tail hook is designed so that it can be moved from extended to retracted. It was not unusual to see this in the down position while on the ramp in case you want to use it to hold up the tail! 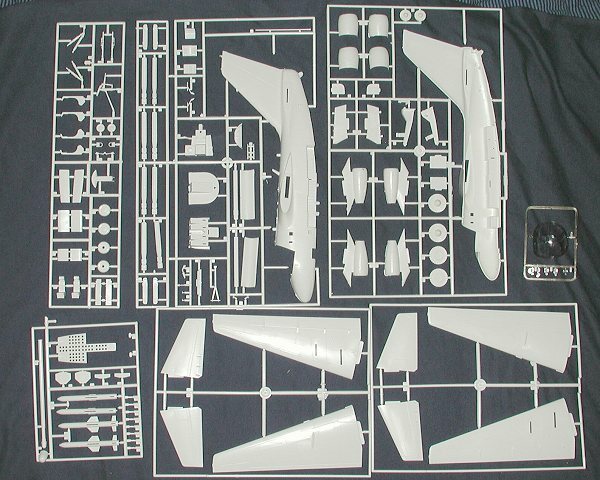 What is really missing from this kit are underwing drop tanks. The plane carried them almost all the time. Later boxings of the ES-3A do include at least one and these may also be in the Italeri boxing. A lot of nose weight will be needed to prevent tail sitting. Instructions are very typical of ESCI, which is to say quite good. It is in the standard pictorial construction steps with color information given throughout the construction sequence. Both generic and FS numbers are provided as are Humbrol numbers, though these may be the second generation numbers and not directly transferable to the more recent Humbrol numbering system. This makes into a relatively large aircraft and those I've seen at shows recently have been most impressive. An easy build it isn't, especially the engine intake seams, but it is a kit you should really think about doing.